The Department of Biochemistry and Molecular Biology is home to more than thirty well-funded research groups, offering opportunities for research that is fundamental in advancing basic science and at the same time provides knowledge that is being translated to help tackle human diseases. The graduate programs in Biochemistry and Molecular Biology therefore provide advanced research-based education with the goal of preparing students for a career in academic, industrial or professional positions in British Columbia and beyond. The Department offers MSc and PhD degree programs, with the option to transfer into the PhD track during the second year. Enrollment in the two programs combined has been steadlily increasing over the last 5 years from about 65 to 84 grads. The requirements for formal course credits are usually completed within the first two academic terms. Course topics include laboratory techniques, nucleic acids, membrane structure and function, cellular regulation, protein chemistry and molecular biology. Additional options include bioinformatics, genome analysis, cell growth and differentiation, bacterial pathogenesis and immuno-genetics. The balance of the program is research intensive and assessed by examination of a dissertation. All students are expected to give a research seminar in each year of their program. It is anticipated that each student will contribute to the successful completion of peer-reviewed publications and will present their work at national and international meetings. The Department of Biochemistry and Molecular Biology has a rich history and on-going record of exceptional academic and research excellence. The Department was home to Nobel Laureate, Michael Smith and his legacy is sustained through involvement of a number of our professors with the Michael Smith Laboratories and the closely-associated Centre for High Throughput Biology. The majority of our research laboratories are located in the Life Sciences Institute, the largest multidisciplinary research hub at UBC. Key features of our research and graduate programs are that they are set up to enable top-notch work, with the very best facilities and with opportunities for collaboration with researchers from a range of disciplines. Research groups in the Life Sciences Institute include those with a focus on diabetes, cardiovascular disease, macular degeneration, bacterial and viral diseases, chemical biology, blood research, molecular epigenetics and others. We encourage you to visit the Department website to check out the specific research interests and achievements of the professors in the Department. A number of our professors have developed and maintain major and cutting-edge equipment that underpins research using macromolecular crystallography, mass spectrometry, nuclear magnetic resonance spectroscopy, high-throughput imaging and a range of spectroscopic techniques for macromolecular analysis. The Department provides tuition benefits to more than half of all students and scholarships to assist with travel to meetings. The Department makes every effort to enable students to gain teaching experience through teaching assistantships, mostly to support teaching in undergraduate laboratory and lecture courses and for which further stipend support is achieved. Overall, the average support package for graduate students exceeds $27,000 per annum. Applicants who are interested in nanomaterials synthesis, characterization and application, and nanoscience instrumentation may consider the NanoMat program that provides additional funding and professional development opportunities. Successful applicants to this program will be provided with a funding package of at least $22,000 for each of the first four years of their PhD. The funding package may consist of any combination of internal or external awards, teaching-related work, research assistantships, and graduate academic assistantships. During the past year we undertook a detailed survey of all graduates who completed their graduate programs in the period from 2003-2014. 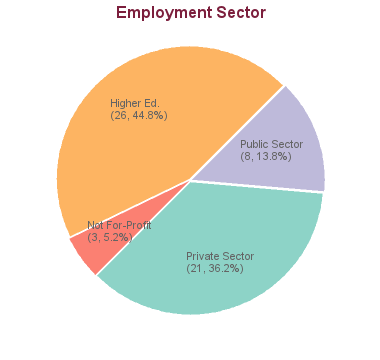 Of the total of 138 graduates, we have tracked the career progress of more than 120 so far. 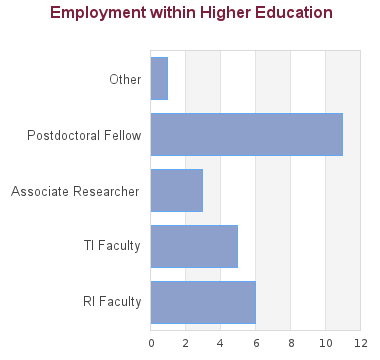 Of this total, 35 have completed further training in graduate and postdoctoral positions, 20 have entered a professional program (mostly in Law or Medicine), 11 have progressed to a tenure-stream faculty position and 32 have full-time research positions in academia (8), industry (21) or government departments (3). Others have established careers in technical writing or management and the most recent cohort (13) are still at a very early stage of career development. Although we need to continue to track and refine our understanding of career outcomes, it is very clear that our programs enable our graduates to achieve career success in a number of academic, professional and commercial areas. This program has a graduation rate of 90.91% based on 11 students admitted between 2005 - 2008. Based on 13 graduations between 2014 - 2017 the minimum time to completion is 3.33 years and the maximum time is 6.33 years with an average of 5.00 years of study. All calculations exclude leave times. Development of methods for study of membrane proteins in the absence of detergents.